Bought an OEM 7 pin harness form dealership for $65 after tax. my 2005 pathfinder already had a 4 pin plug but i wanted to upgrade to pull my friends landscaping trailer. The instruction that came with it are very good and the project would have only taken about 20-30 minutes had there not been a blown fuse. (i bought the car used so i think it was already blown when i did the conversion. I took some photos as i went along to help the next guy and i can answer some basic questions but the project really is very easy, on scale of 1-10 its about a 2. 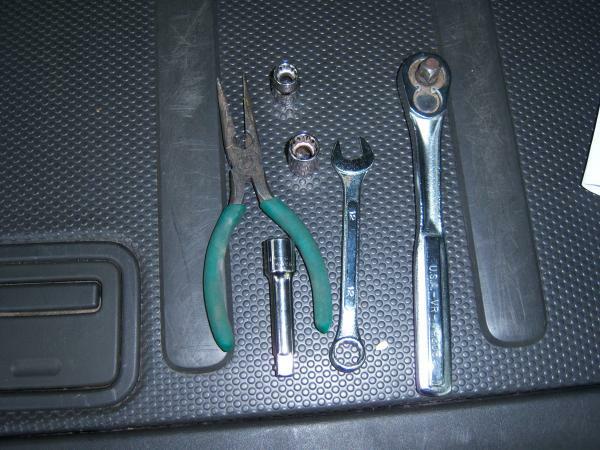 These are the only tools you should need, i used the needle nose pliers to get the brown wire clips removed fromthe old harness. 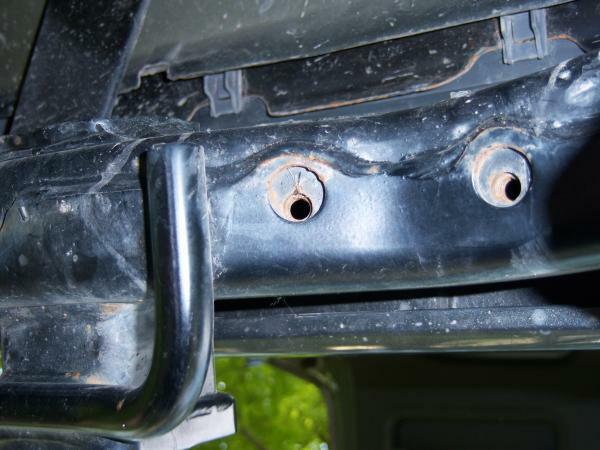 This was the hardest part, before sliding the connector into the mounting bracket you have to remove the the bolt that holds the bumper on so you can work the wires around behind the bracket the replace the bolt. Last edited by NissanTech; 04-25-2011 at 09:21 PM. one more quick note after the installation i couldn't get the left turn blinker on the trailer working. both blinkers on the car worked, and on the trailer the stop lights,running lights and and right hand turn signal worked but not the left hand signal. 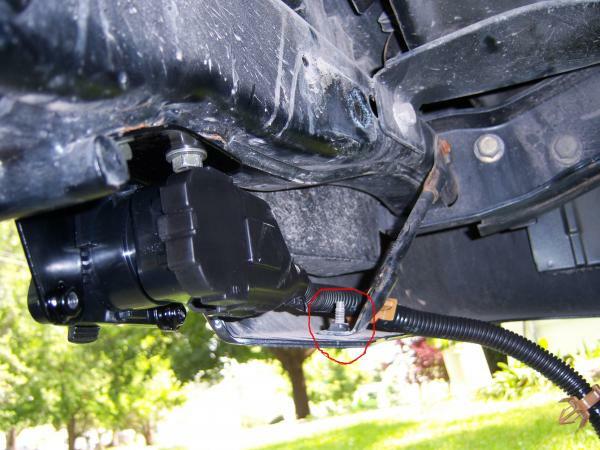 I checked fuses in the glove box and engine compartment and found nothing wrong, then after a little more internet research i found that Nissan placed the fusses for the trailer left and right turn signal in the F.....ing dumbest possible place (IMHO). To get to them i had to take off the knee panel under the steering column which isn't hard but takes a little time---almost 10 minutes to get to the stupid little fuses here's a picture of them. Thank you for the pictures! I'm sure many users will find the information very helpful. i want connect a RV Trailer using electric brake controller. is this wiring also working for EBC? dsmo274, You are the BEST!! 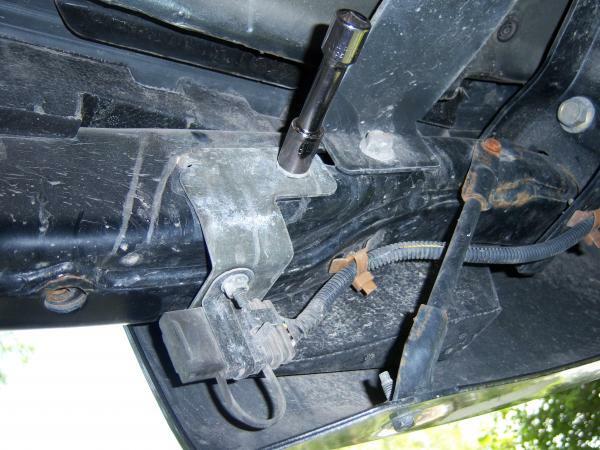 The picture showing where the trailer harness fuses are located saved my bacon. I spent hours trying to figure out why my left turn signal and brake lights wouldn't work on the trailer. This posting was extremely helpful. Thank you dsm0274 for the description and pictures. 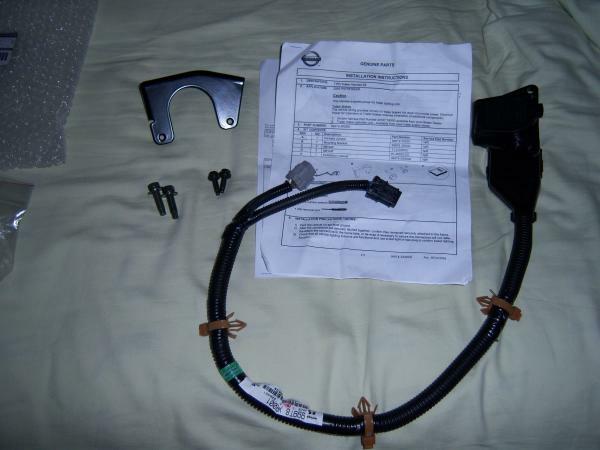 I just finished a round 7-way towing harness installation on a 2008 Pathfinder, and this posting helped make it an easy project. The only extra step I had to take was to install a towing relay to activate the full functionality of the 7-way plug, specifically the charge wire. 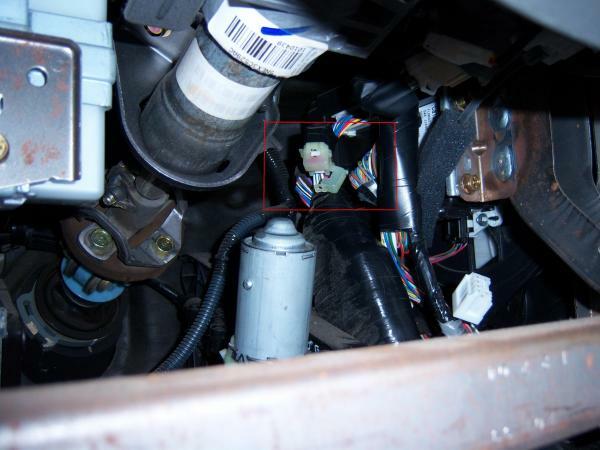 There are two towing relays under the hood near the battery. The first one was already installed (presumably to activate the running lights and signal for the existing 4-pin towing harness). The second one was not installed, so I had to order that (Part number: 25230-7996A, $38) and install it to get the charge wire to work. I was wandering if anyone had any images of where the brake controller hooks up underneath the dash. I know this might be a little redundant but I just bought this thing and I haven't really gotten under there yet. DSM0274 thanks for the info. I see now. 1. 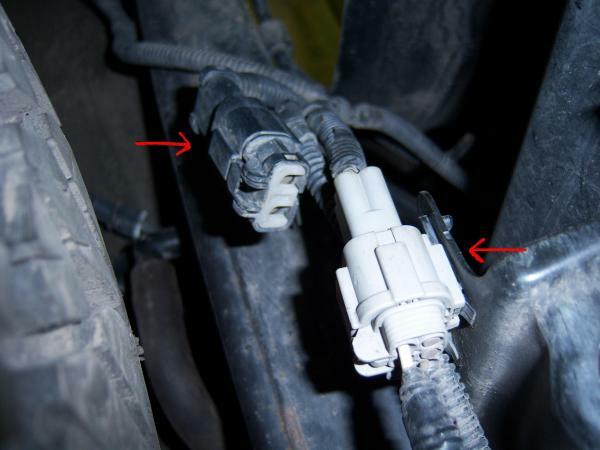 Get under the pathfinder and pull out the black "dummy plug" in the main trailer wire harness by the driver's rear tire of the SUV. (This plug is exactly like the the real one that would normally have the wires in it. 2. Plug in your relay under the hood. 3. With a volt meter(and the ignition key turned to the "ON" position)....find which lead has a constant 12 volt current at the female portion of that plug. 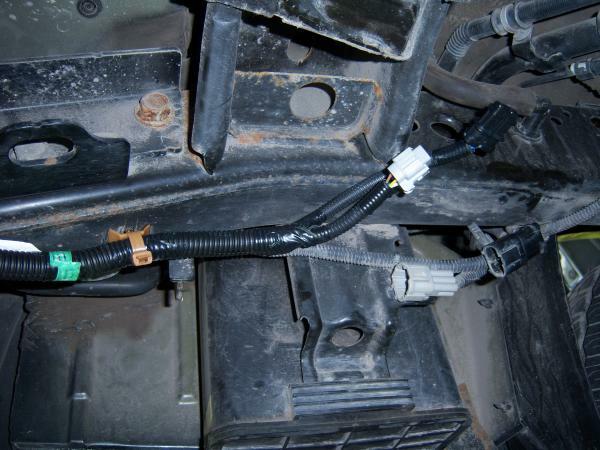 That is your 12 volt supply line to your trailer. On those Hopkins Universal 7 pin plugs that is a black wire. (Refer to the schematic that comes with your plug!!!!!!) . The other metal lead will be your blue brake controller line. 4. Take your dummy plug and carefully remove the plastic retainer clip and the two rubber plugs. 5. Get (2) 16-14 AWG 1/4" female disconectors and remove the plastic sheath from the back of them. (pics to follow.) connect your black wire to the side that has been predetermined to be the 12 volt hot side and then the blue to the other. 6. slide the wire and "naked terminal" into your now opened Factory dummy plug with wires sticking now out the back. 7. Drill small holes through the centers of your rubber retaining plugs and then slide them down into there holes around the wires. (a small screwdriver really helps to put them back into place.) 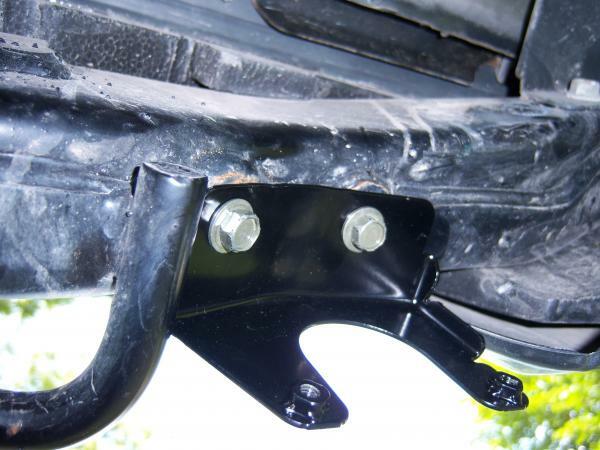 Then replace your retaining clip. 8. Wire your universal plug to you new homemade factory plug. 9. Plug it in and enjoy the fact you just saved some money and "STUCK IT TO THE MAN!!! This post is the gift that keeps on giving! Thank you very much. I followed these instructions for my recently purchased 2008 Pathfinder LE V8 and had no issues, saving a ~$120 install (quotes from two vendors). 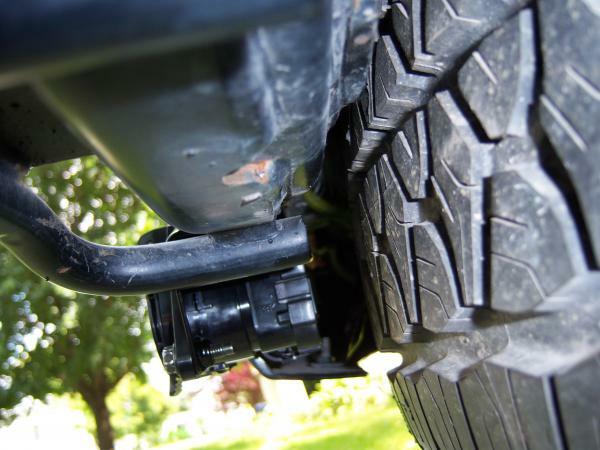 I was able to do the install without removing the spare tire, which saved some hassle. Even better, my 5 year old daughter was thrilled to be my assistant. Now I just need to find the thread that shows how to pull up the center console to install the controller mount in that little cubby under the radio (please reply if you know the link). I have attached two pics. I am well over six feet tall and I don't have a problem with where I mounted mine. Try this idea out. What I'm trying to determine now is what relay and/or fuse do I need to install. I am towing a boat that has surge brakes so I'm not using a brake controller. So do I need both the relay and fuse? If so, what size fuse do I need for the connector under the dash? This post was extremely helpful to me...after the fact....but I'd like to add some additional info that might help someone out. I called Etrailer to complain and was told that they sell many of those wire harnesses and have never had a complaint. They insisted that it should fit my 2008 Pathfinder SE with tow package. After doing some internet research i did in fact find a few posts with the same problem (one of which was on the Etrailer.com "Questions" page by the way). 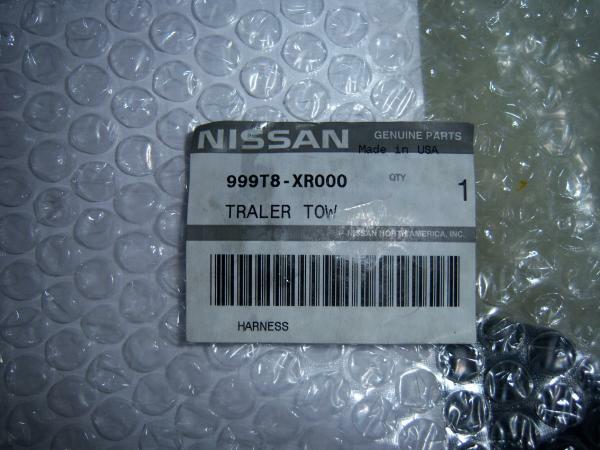 Long story short....I finally tracked down the 999T8-XR024 Tow Kit with harness from a Nissan dealer an hour away...but it was well worth it. It had the correct 8 pin gray harness. FYI, in addition to the gray and black harnesses it also had a third one (2 pin gray). From what I found out it is for models equipped with I-Key, which my 2008 is not. The Nissan part fit perfectly and installed in 15 min..start to finish. Unfortunately, in addition to Etrailer sending me a part that I could not use for my car they also gave me incorrect information. They told me that that harness was all I needed to have lights AND electric breaks. Im a weekend warrior hack so I had no idea that I also need Nissan Parts# 24167-7S000 (Electronic Brake Jumper) and 25230-7996A (Relay). I also didn't know I needed to purchase a Brake Controller.....like I said, I'm a hack. Luckily the parts guy at Acme Nissan in South Brunswick NJ told me everything I needed to know and even had all the parts in stock. I probably could have gotten the jumper and relay someplace cheaper but after my ordeal with Etrailer trying to save a few bucks I was happy to pay the dealer full price. The knowledge alone was worth it. It was only after I figured all this out that I came across this post. Had i found it earlier it could have saved me a lot of time and headache but oh well. Hopefully this helps someone else out in the future.